Are you hoping that your partner will pop the question over the holidays? While you can’t force his/her hand, you can still help move things along. If you’re worried that your partner is dragging his/her feet, here are six creative ways to make it known that if he/she likes it, then he/she should put a ring on it. 1 Do drop a hint. If you’re ready to take the next step, make it known! Don’t just hope that your partner will read your mind. Asking someone to marry you is a huge step in a relationship and the fear of rejection is a strong force to reckon with. Eliminate that fear by slipping subtle signs into your daily conversation. Talk about your feelings (you’re so happy with your partner), how all your friends and family love him/her (shows where he/she fits into your life), and how you can’t wait for all the adventures you’re going to experience together (there’s a future here). You don’t want to force the marriage card, but you can gently nudge your partner in that direction. Just make sure he/she understands just how secure you feel in the relationship. Oh, and if you already have a ring in mind, you can actually drop a hint without saying a word, thanks to Hint & Whisper… Yes, it’s real! 2 Don't pose an ultimatum. It may be tempting to tell your beau that you want him/her to propose by the end of the year (or else! ), but that’s probably going to backfire. Maybe your partner does need something to jumpstart the process, but an ultimatum can feel too final and forceful. 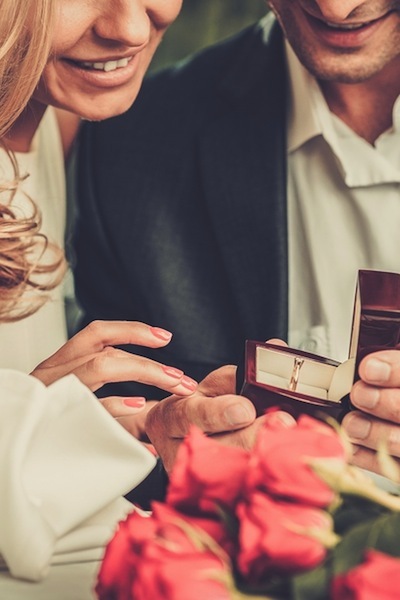 Being too preoccupied on a proposal can become a weight on your relationship, causing tension, problems, and fighting where they don’t need to be. Instead of becoming fixated on WHEN your partner will propose and WHY he/she hasn’t done so already, try to focus on the intimate moments you share on a daily basis. The more you embrace the good (your feelings for each other) over the bad (the lack of a proposal), the better your relationship will be…and the sooner you’ll be calling each other fiancé! 3 Do talk about the future. Another way to make it known how you feel is to talk about growing old together. If done right, you won’t seem clingy, rather you’ll seem committed. Have some serious conversations about the future: kids, your living arrangement, how to handle the tough times, and life priorities. You don’t need to nail down the specifics just yet, but it’s important to have those big conversations in broad strokes. Bringing up the future is a clear sign that you’re in this for the long haul and ready to move the relationship forward. The more confident your partner is that he/she will get the “yes,” the sooner you’ll see a ring! No, Loverlies, we’re not saying dump your partner if you don’t see a ring on your finger by some mystical date. But…who says you have to wait around for someone else to pop the question?! If you know what you want, take matters into your own hands and pop the question yourself! Just be sure you understand where your partner stands in terms of where your relationship is and how you picture your future together. There’s nothing less romantic than rushing/demanding a proposal because you have an arbitrary deadline in mind. Give things time and see how they play out before you make a move. It may seem like your partner is taking things slow for no reason, but he/she may be trying to save up enough money for a ring or waiting for the right time to ask your parents for permission. Of course, there are some deadlines that are very real (like if you want to have a couple of kids), so if you’ve been patient and are still seeing no signs of commitment, maybe it’s time to have a serious conversation…or move on. 6 Don't sweat the small stuff. If you were ready to be engaged yesterday, it’s not easy to be patient. But, if you think about the big picture, that might help you keep your expectations in check. You and your partner are going to spend the rest of your lives together (cheers to 50+ years! ), so does it really matter if you get engaged NOW versus a few months from now? Also, make sure everyone, from your mom to your BFF to your Uncle Tom, knows that you don’t want to pressure your partner into proposing. They may feel the need to take it upon themselves to drop a not-so-subtle hint on your behalf.